In this study, the influence of sodium citrate dehydrates (SC) salts on the rheological properties of a thermoresponsive hydrogel was investigated. The hydrogel was prepared by combining 8 w/v % methylcellulose (MC) and 2.5 w/v % gelatin with various SC concentrations. Synthesized hydrogels were characterized by using Fourier Transform Infrared Spectroscopy and Scanning Electron Microscopy. Subsequently, the effect of 1, 2 and 3 w/v % of SC on the gelation temperature was investigated by test tube tilting method. 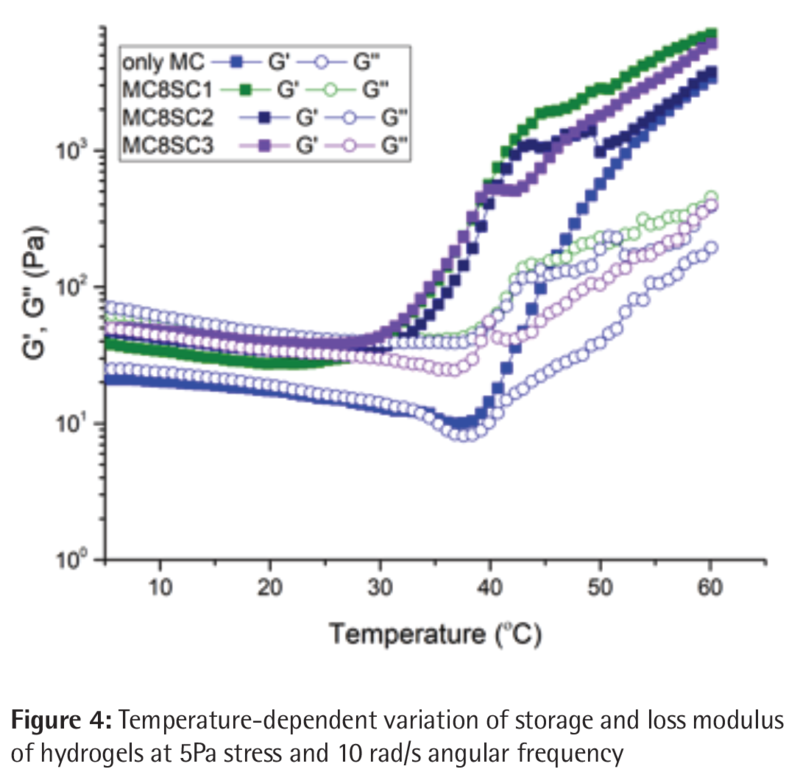 Time and temperature dependent variations of loss (G’’) and storage (G’) modulus and complex viscosity (Pa.s) of hydrogels were investigated by using oscillation rheometer. The sharp increase of G’ and Pa.s indicates the gelation temperature and gelation time. The results show that the addition of SC to the MC/gelatin blend decreased the gelation temperature from 32 °C to ~27 °C. There are no significant differences between gelation time of hydrogel samples for the prepared concentrations. However, the complex viscosity and gel strength clearly increased by incorporation of SC salts. Overall, the results suggest that incorporation of citric acid to methylcellulose based hydrogels significantly affects their rheological properties. Hydrogels are the crosslinked polymeric network structures which absorb water (1). They are widely used in the medical field, such as drug delivery systems, dental materials, implants, injectable polymeric systems, ophthalmic applications, wound dressing and tissue engineering (2,3). Although hydrogels are commonly practiced for medical applications, their potential for drug delivery and tissue engineering applications still needs to be further developed. Some of the hydrogels can be formed by temperature-responsive phase transitions, therefore they absorb considerable amount of water while preserving their shape (4). This feature enables injectability of some of the polymers. Methylcellulose (MC) is an example of an injectable thermoresponsive hydrogel which undergoes phase transition because of hydrophobic interactions during heating (5). Studies showed that salts are helping to reduce the gelation temperature of MC to around physiological temperature by their salts-out effect (5,6). Sodium citrate dehydrate (SC) is one of the salts which leads to salts-out effect (6). 2.5 w/v % gelatin solution was also incorporated with MC solution to increase the cellular activity by its RGD groups. The objective of the study is to examine rheological behavior of MC solution after addition of 1, 2 and 3 w/v % of SC salts. 12% of methylcellulose (MC) solution was prepared by dissolving it in distilled water at 90 °C until MC powder was completely dispersed. Then the dispersed MC solution was stored in refrigerator overnight to obtain clear MC solution which was used as a stock solution throughout the experiment (7). Desired amount of gelatin was also dissolved in distilled water at 50 °C and allowed to cool down at room temperature before use (8). 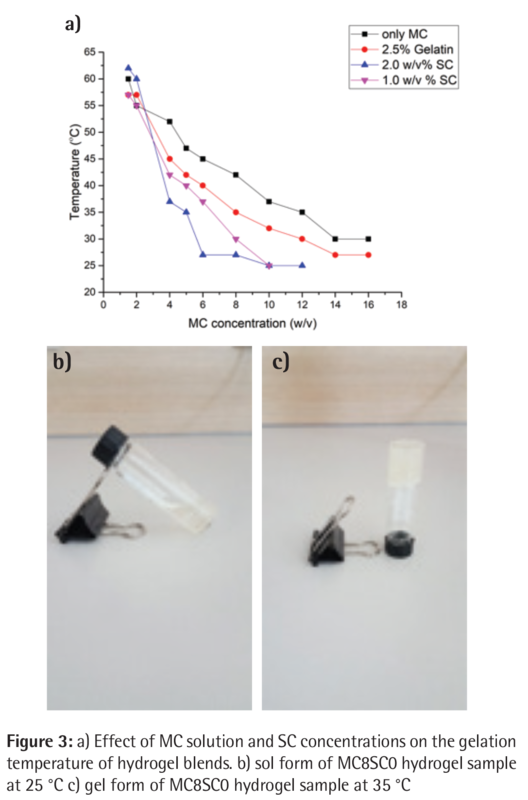 After preparation of MC and gelatin solution, MC/gelatin blend solution was prepared with the final MC and gelatin concentration of 8 w/v % and 2.5 w/v %, respectively. In situ gelling system was developed by incorporation of 0.5 to 3 w/v % sodium citrate dehydrate (SC) solution with MC/gelatin blend. Functional groups of the synthesized hydrogels were detected by using FTIR spectrometer from 4000 to 400 cm-1 with Thermo Scientific Smart Orbit model (9). 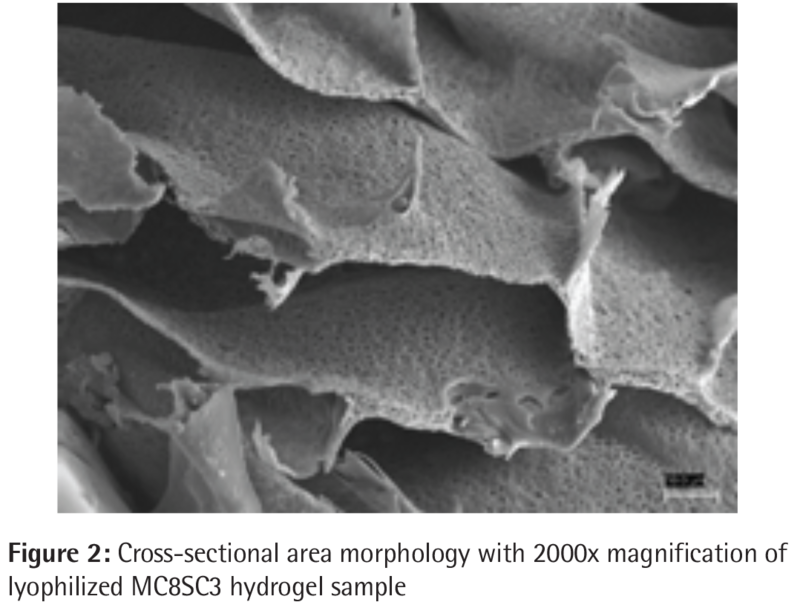 The morphology and microstructure of the lyophilized hydrogels were examined by using scanning electron microscopy (SEM) (Zeiss, Evo LS10) with 10kV accelerating voltage at Yıldız Technical University, Istanbul, Turkey (30). Samples were coated with gold-palladium before the study (6). The sol–gel transition temperature of the hydrogels were measured by the test tube tilting method (TTM) (10). The solution was poured in a 5 mL glass tube and placed in a controlled temperature water-bath to measure the gelation temperature. The temperature of the bath was slowly increased. With the rise of temperature, the solution was completely converted into hydrogels. The gel became thick and did not flow with the tilting of the test tube. The temperature at which the solution stopped flowing was recorded as the gelation temperature. Rheological measurements of hydrogels were performed by using stress-controlled rheometer with a parallel plate geometry (diameter: 15mm) at Boğaziçi University, Istanbul, Turkey. The rheological properties of the samples were analyzed within the linear viscoelastic region of the hydrogels at a stress of 5Pa and a frequency of 10rad/s. To measure the gelation and setting temperature of the hydrogels, temperature sweep was performed from 5 to 60 °C at a heating rate of 1 °C/min. Time sweep was conducted at 37 °C to analyze the gelation kinetics (7,11). 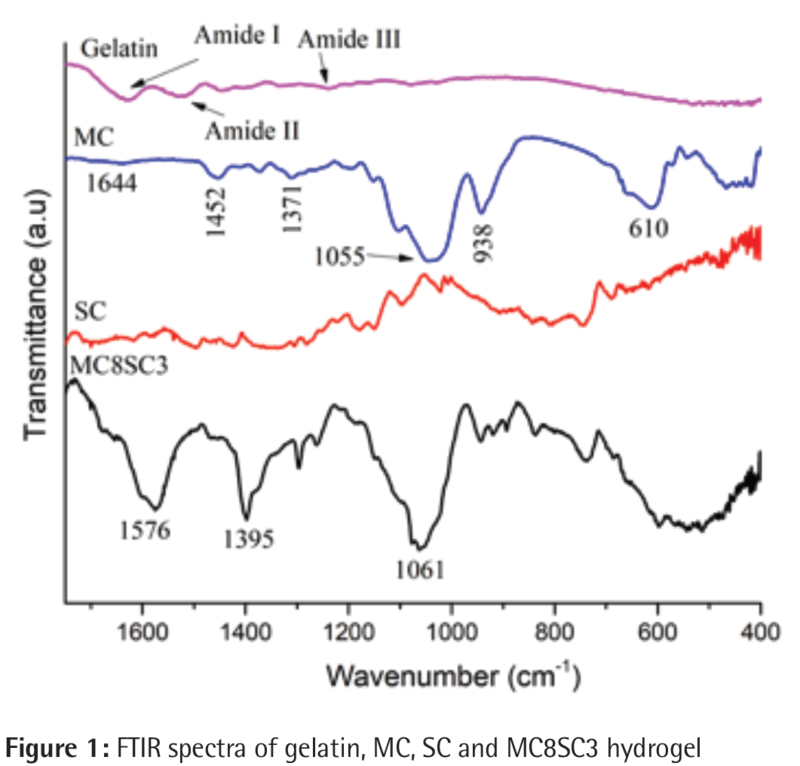 Figure 1 shows the FTIR spectra of gelatin, MC, SC and MC8SC3 hydrogel. FTIR spectra of MC8SC3 hydrogel sample was showed that the characteristic peaks at 1395 and 1576 cm-1 correspond to the symmetric and anti-symmetric stretching of COO- (9). The broad peak at 1055 cm-1 is related to the C-O stretching for MC8SC3. The values of the peak shifted from 1055 to 1061 cm-1 with the addition of SC. Both Amide I at 1633 cm-1 and β-gylcosides bonds among saccharide units at 900-1230 cm-1 are clearly seen. 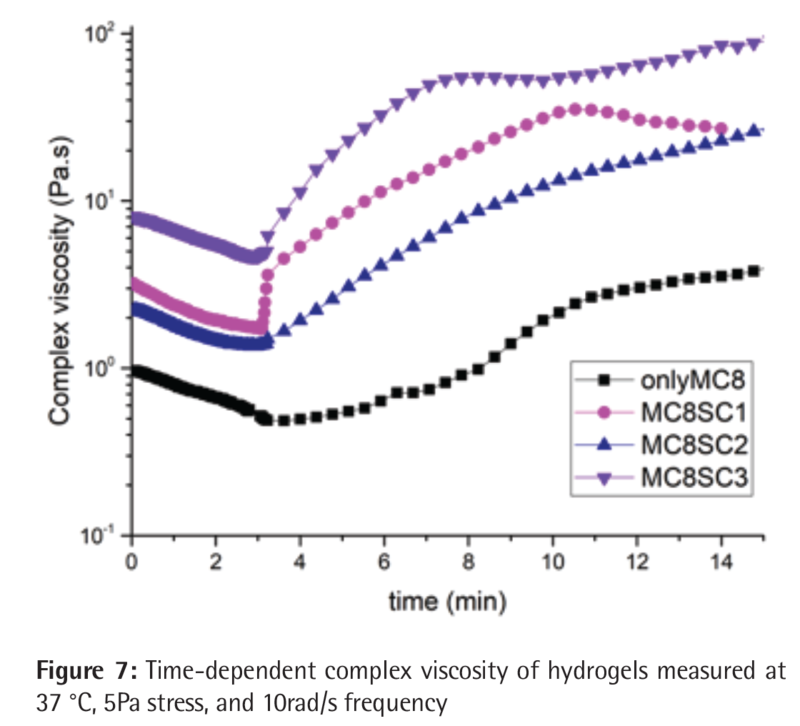 Figure 2 shows the morphology of the cross-sectional area of MC8SC3 hydrogel sample. Figure 3 shows the gelation temperature of all hydrogel blends measured by TTM. 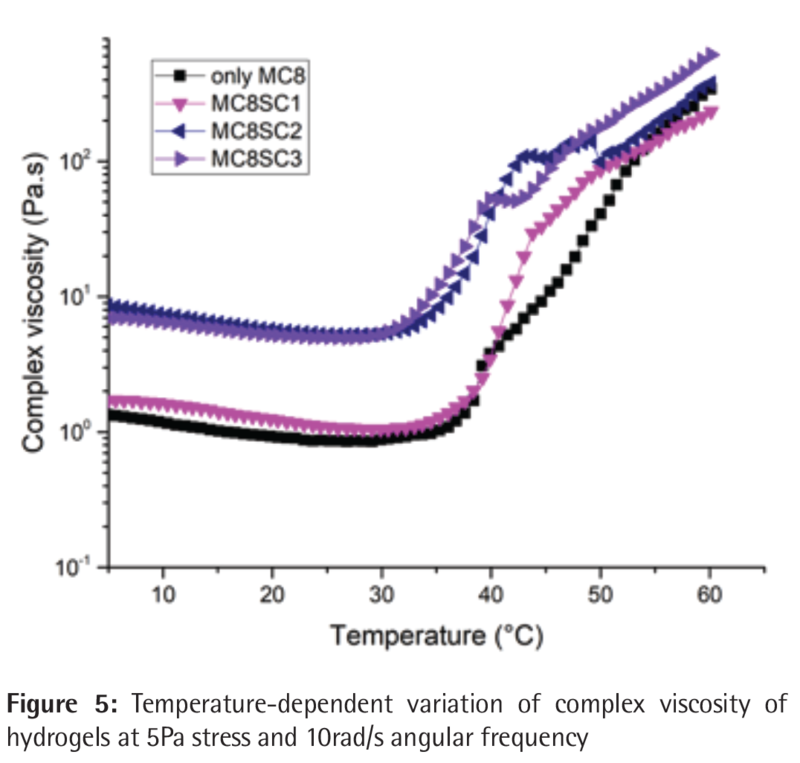 Results show that the increase of SC concentration decreases the gelation temperature of MC solution from 60 °C to ~30 °C. Rheological measurements of hydrogels were performed within linear viscoelastic region therefore, 5Pa stress and 10rad/s frequency were applied for both time and temperature sweep measurements. Figure 4 and Figure 5 show the temperature dependent variations of G’ and G’’ and complex viscosity of hydrogels, respectively. Temperature dependent measurement of G’ and G’’ reveals not only the gel strength, but also gelation temperature as reported in the literature (7). The sharp increase in G’ implies the gelation of hydrogels therefore the gelation temperature is detected. In Figure 4, it is clear that the addition of SC salts to MC-gelatin blend decreases the gelation temperature from 32 °C to ~27 °C. Figure 6 and 7 show the time dependent variations of G’ and G’’ and complex viscosity of hydrogels, respectively. In the same manner, gelation time is also strongly dependent on the tendency to form hydrophobic aggregates as in the temperature sweep measurements. For time sweep measurement, it kept constant at 37 °C and the measurements were conducted for 14 min. The sharp increase of G’ and Pa.s indicates the gelation time for hydrogel samples (4-6). As it is seen from Figure 6, there are no significant differences of gelation time for each sample. 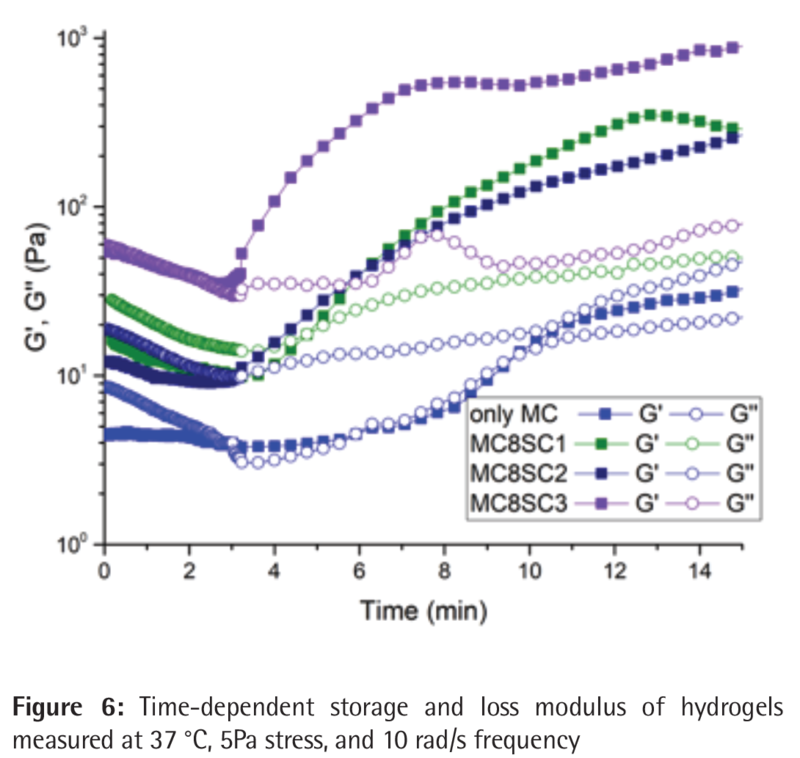 On the other hand, the hydrogels sample labeled MC8SC3 had much higher gel strength. In this study, the effect of citric acid on the gelation of methyl cellulose was investigated. Accordingly, FTIR, SEM and rheological analysis were conducted. FTIR data confirms the interaction between citrate ions and MC (12). The peak values corresponding to the C-O stretching shifted from 1055 to 1061 cm-1 due to presented citrate salts. The symmetric and anti-symmetric stretching of COO- at 1395 and 1576 cm-1 at FTIR spectra of MC8SC3 hydrogel sample was also support the interaction of citrate ions and MC (9). SEM micrographs reveal the interconnected porous microstructure. In the Figure 2, pores are homogenous which means that the SC salts were distributed evenly in the hydrogel (13). Bain et al. (6) indicated that heating destroys the cage-like structure between MC chains and water molecules therefore, aggregates form due to hydrophobic interactions. This is called salt-out effect and it leads to gelation of hydrogel at around 30°C. Incorporation of SC helps to destroy the cage-like structure between MC and water molecules and therefore forms the hydrophobic aggregates at a lower temperature (1,6). When SC salts are added to the MC solution, the water molecules are attracted to the citrate ions which suppresses intermolecular hydrogen bond formation between water and hydroxyl group of MC. This depletion of water layer around hydroxyl groups of MC causes enhancement of hydrophobic-hydrophobic interaction between MC ions which leads to gelation at a lower temperature (5,6). It can be concluded from here that, the addition of SC salts decreased the gelation temperature effectively but did not affect significantly the gelation time. At each temperature, the addition of SC salts also increased the gel strength which is evident from the increase of G’ and Pa.s values. Overall, addition of SC salt to MC has a positive effect on formation of hydrogels. In this study, the effect of SC concentration on rheological properties of MC/gelatin blend were investigated. It was observed that the gelation temperature depended on SC concentration when the MC and gelatin concentrations were kept constant. The gelation temperature decreased effectively by incorporation of SC salts, however there is no significant effect of SC concentration on gelation time. Moreover, the addition of SC salts increase the gel strength which is evident from the increase of G’ and Pa.s values at the physiological temperature. The results indicate that the studied thermoresponsive hydrogels have potential to be used as a drug delivery platform for biomedical applications. Kim MH, Park H, Park WH. Effect of pH and precursor salts on in situ formation of calcium phosphate nanoparticles in methylcellulose hydrogel. Carbohydr Polym. 2018;191:176-182. Rosiak JM, Yoshii F. Hydrogels and their medical applications. Nucl Instrum Methods Phys Res B. 1999;151:56–64. Caló E, Khutoryanskiy VV. Biomedical applications of hydrogels: A review of patents and commercial products. European Polymer Journal. 2015;65:252–267. Ying L, Jiali S, Guoqiang J, Jia Z, et al. In vitro Evaluation of Lysozyme-loaded Microspheres in Thermosensitive Methylcellulose-based Hydrogel. Chinese Journal of Chemical Engineering. 2007;15:566–572. Shimokawa K, Saegusa K, Ishii F. Rheological properties of reversible thermo-setting in situ gelling solutions with the methylcellulose-polyethylene glycol-citric acid ternary system (2): Effects of various water-soluble polymers and salts on the gelling temperature. Colloids Surf B Biointerfaces. 2009;74:56-58. Bain MK, Maity D, Bhowmick B, et al. Effect of PEG-salt mixture on the gelation temperature and morphology of MC gel for sustained delivery of drug. Carbohydr Polym. 2013;91:529-536. Liu Z, Yao P. Injectable thermo-responsive hydrogel composed of xanthan gum and methylcellulose double networks with shear-thinning property. Carbohydr Polym. 2015;132:490-498. Fang J, Yang Z, Tan S, et al. Injectable gel graft for bone defect repair. Regen Med. 2014;9:41-51. Mohan JC, Praveen G, Chennazhi KP, et al. Functionalised gold nanoparticles for selective induction of in vitro apoptosis among human cancer cell lines. J Exp Nanosci. 2013;8:32–45. Zhang Y, Gao C, Li X, et al. Thermosensitive methyl cellulose-based injectable hydrogels for post-operation anti-adhesion. Carbohydr Polym. 2014;101:171-178. Fan R, Deng X, Zhou L, et al. Injectable thermosensitive hydrogel composite with surface-functionalized calcium phosphate as raw materials. Int J Nanomedicine. 2014;9:615-626. Kozlowska J, Stachowiak N, Sionkowska A. Collagen / gelatin / hydroxyethyl cellulose composites containing microspheres based on collagen and gelatin : design and evaluation. Polymers. 2017;10:456. Wang T, Chen L, Shen T, et al. International Journal of Biological Macromolecules Preparation and properties of a novel thermo-sensitive hydrogel based on chitosan / hydroxypropyl methylcellulose / glycerol. Int J Biol Macromol. 2016;93:775-782.